If you have a passion for environmental issues and the resume to prove it, consider applying for one of these five scholarships to receive help with college expenses. 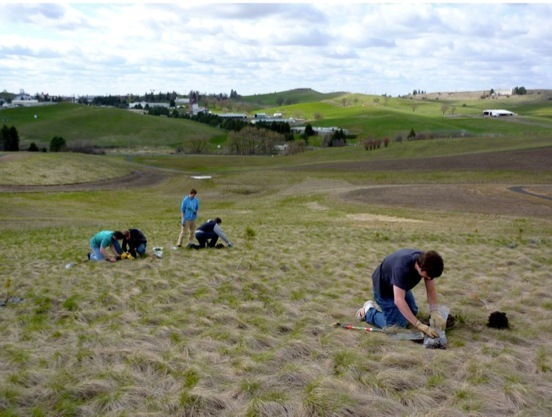 WSU students planting trees in the arboretum during Earth Day. Are you known around your campus and community for being nuts about nature? If so, you may be eligible for a scholarship aimed at environmentally minded students. Leverage your green activism into financial assistance by considering these five unique scholarships. By being proactive about applying for scholarships, you can continue to fight the green fight while also working towards paying for college. Every year, six young environmentalists (ages 13 to 22) win the Brower Youth Award for their environmental projects or campaigns. The judges look for candidates who lead a project or campaign that offers a fresh, sustainable, impactful approach to current environmental problems. Winners receive $3,000, a professional short film that tells the story of their project, and a free trip to the San Francisco Bay Area for a week-long bonanza of camping, conferences and leadership activities. Negative Population Growth (NPG), a non-profit organization that educates people about the negative environmental effects of overpopulation, offers two scholarship contests annually: an essay contest wherein students submit an essay about why overpopulation matters, and a photo contest wherein students submit a photo of an environmental treasure that’s threatened by overpopulation. High school seniors are eligible to apply for both scholarships and winners receive between $500 and $2,500. 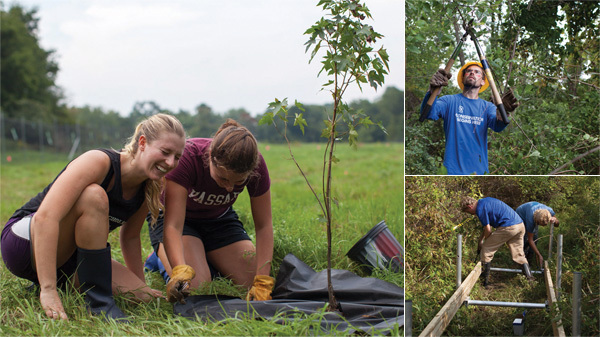 Vassar students help combat invasive species while building boardwalks in an effort to restore the local wetlands. In order to spread awareness about the importance of recycling, ink company Castle Ink offers students a way to win some money without having to do much work. To become a candidate for winning $1,000 through the Castle Ink Paperless Scholarship, simply “pin” something about a used printer or printer ink cartridge on Pinterest or post something inspirational about recycling on YouTube, Pinterest, Twitter, Tumblr or Facebook with the hashtag #CastleInk. Simple enough! In order to be in the running for the Apprentice Ecologist Scholarship offered by non-profit charitable organization Nicodemus Wilderness Project, students must conduct their own environmental stewardship project, take photos of it, and then write an essay about their experience. Examples of past projects have included removing and recycling trash, planting trees, starting a composting program and removing graffiti from natural areas. Three environmentally minded winners each receive $850 annually to put towards college tuition and expenses. The Environmental Research Center (ERC), a non-profit organization dedicated to reducing the use of hazardous and toxic substances in California, offers three high school seniors $1,000 annually for their interest in environmental health sciences and their dedication to environmental stewardship. To be eligible for the ERC’s Eco Scholarship Fund, students must have a GPA of at least 3.25, have completed an elective science course (in addition to their high school’s required one), and have plans to major in environmental science at a college in California. By being proactive about applying for these scholarships, you can continue to fight the green fight while also working towards paying for college.